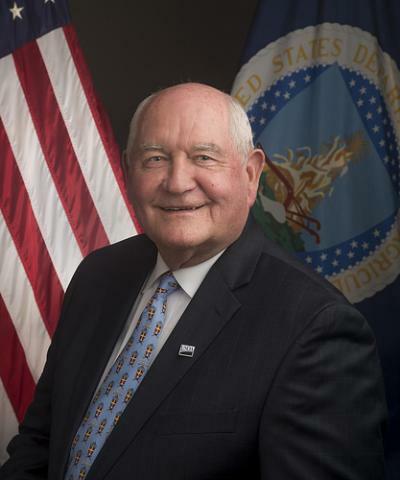 Newly minted Agriculture Secretary Sonny Perdue ditched his coat and tie, and rolled up his sleeves Tuesday morning, getting to work at the Department of Agriculture during an address to USDA employees. Following Senate confirmation Monday, the former Georgia Governor was sworn in Tuesday morning by Supreme Court Associate Justice Clarence Thomas, also from Georgia. Perdue preached transparency, ethics and customer service, before heading to the White House to take part in a farmer roundtable and the signing of an executive order related to agriculture. Perdue will now head to the USDA Service Center in Kansas City, Missouri this week, and take part in a town hall Friday at the American Royal Complex hosted by the Agribusiness Council of Kansas City. Senator Tammy Baldwin of Wisconsin has also asked the Secretary to visit Wisconsin, where dairy farmers are dealing with what they have called “unfair practices” by Canada. Secretary of Agriculture Sonny Perdue gives his first remarks to USDA staff. Sonny Perdue came by his knowledge of agriculture the old fashioned way: he was born into a farming family in Bonaire, Georgia. From childhood, and through his life in business and elected office, Perdue has experienced the industry from every possible perspective. Uniquely qualified as a former farmer, agribusinessman, veterinarian, Air Force veteran, state legislator, and governor of Georgia, he is the 31st United States Secretary of the Department of Agriculture.